Here are the types of companies pitching to webhosts. The show floor at WHD.usa. I’m writing this from a familiar place for the domain industry: the Tropicana Hotel in Las Vegas. 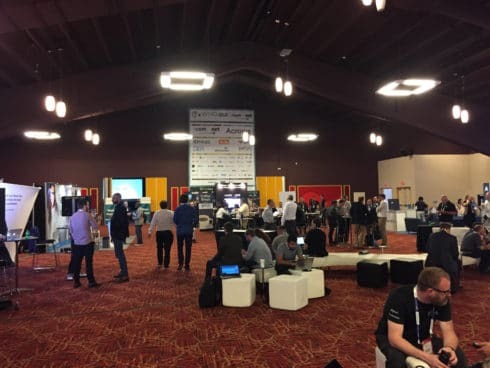 I’m surrounded by the exhibit floor at WHD.usa, a web hosting industry conference put on by the same group that now runs NamesCon (which will be in the same hotel in January). Website builders – These companies, including Duda and CM4all, offer website builders for webhosts. Domain registrars and hosts need an easy way for their customers to create websites and become sticky customers. Installing and creating a WordPress site is too technical for many users, and that’s where these companies step in. They offer white label or branded website builders that hosts/registrars offer to their customers. Most of these use a proprietary building platform, but Boldgrid is an example of one that makes it easy to start a WordPress site. Domain reseller systems – OpenSRS and Enom have a co-branded booth this time around as they are no longer competing with each other after Tucows acquired Enom. InterNetX and Ascio also have booths. .Com registry Verisign is the headline sponsor. Backup and security – This is a big area. There are spam filtering companies, backup protection, security systems and more. Some of these companies sell directly to end users and others offer their services to hosting companies that, in turn, offer them to their hosting customers. Of course, these are just the sponsors. Attendees include companies all around the hosting ecosystem including the hosts themselves.